Look people, even though I’ve lost a tremendous amount of weight over the last few years, I still don’t consider myself the most attractive dude on the planet. I’m just not, but I don’t think I’m exactly Brian Peppers, either. In other words, honestly I believe that my physical appearance has improved tremendously now that the extra 95 pounds* are gone but am I model material? GTFO! But seriously, I’m having second thoughts because there have been a few incidents over the past few weeks that have started to make me wonder. Incident #1: In the middle of doing some last-minute Christmas shopping, Ann and I stopped for lunch at Lee’s Sandwiches (which, by the way, are the proverbial bomb). 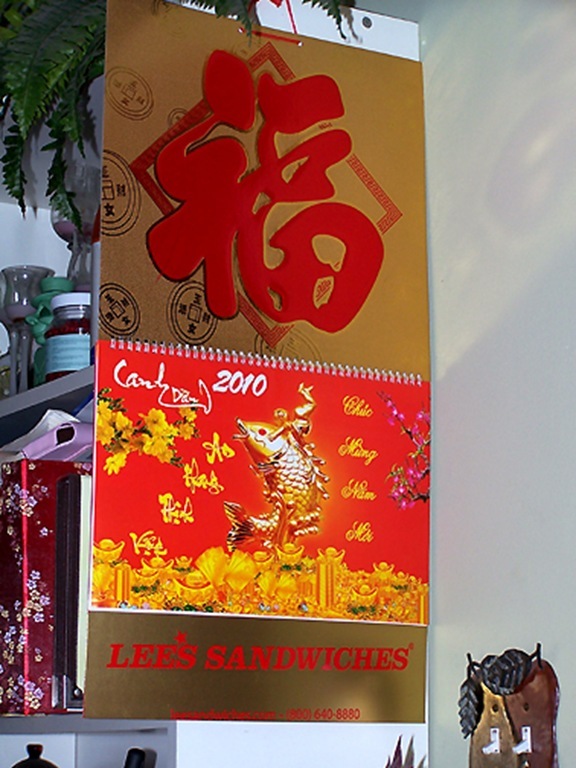 We placed our order and then while waiting for our number to be called, I noticed a poster that was advertising these incredibly awesome Vietnamese calendars branded with the Lee’s Sandwiches logo (see photo to left). The artist in me was awestruck by the color scheme of the calendar—you can never go wrong with red and gold or Asian art in general, and there was no way I was going home without one of these. The only bummer was that they were free with a $20 purchase and our order only came out to a little over $12. I was pretty much skunked but I still wanted one, so I approached the counter and kindly asked the young lady at the register about it. “Ummm…” she replied. I smiled. They then all huddled in the corner. You could practically hear the gears turning and then finally came a verdict from the one that looked like she was in charge. “In the spirit of the holidays, we’ll go ahead and give you one,” she said, smiling. “Cool. That’s awesome and I really appreciate it. I just don’t you ladies to get in trouble for giving one away,” I said. “No no, it’s okay,” the boss-lady insisted. I thanked them all and walked back, calendar in hand, to a quizzical Ann. “Oh, quit flirting with the girls,” she exclaimed. I laughed as I began to examine my new acquisition. I hung it on me wall when I got home and man, I’m gonna hate to have to throw it away when 2011 comes around.